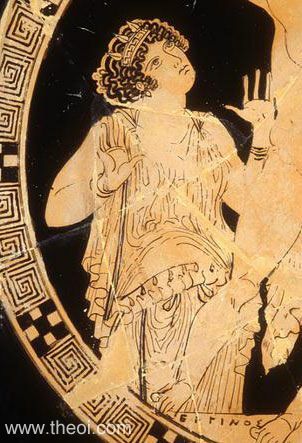 Detail of Gaea from a painting depicting the Gigantomachia (War of the Giants). Gaea the Earth raises her hands, pleading for the lives of her Gigante sons as they are slaughtered in a battle with the gods. She is depicted as a matronly woman half-risen from the ground with a heavy belly, full face, short, curly hair and spiked, stephane crown.